Barcelona, May 11, 2018. 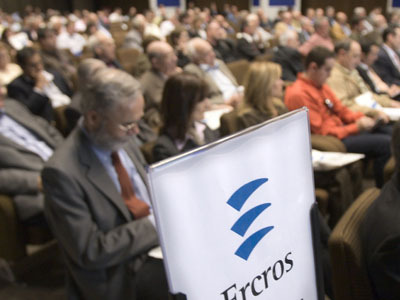 - The board of directors of Ercros will propose to the ordinary general meeting a compensation for the shareholders amounting 15.58 million euros, which represents a 35% payout of 2017 consolidated profit, which amounted 44.49 million euros. This payout is the one foreseen in the shareholder remuneration policy for that year, which also provides for the payment of a minimum dividend by 12%. The shareholder remuneration policy for the period 2017-2020 establishes two ways to remunerate the shareholders of Ercros: dividend payment and the purchase of treasury shares to amortize; provided that three conditions are met: obtaining a minimum consolidated profit equivalent to 0.10 euros/share; a solvency ratio (net financial debt/ordinary ebitda), less than or equal to 2; and a leverage ratio (net financial debt/total equity), less than or equal to 0.5. In the past year, Ercros complied with the three conditions mentioned: the profit per share was 0.3963 euros; the solvency ratio was 1.20 and the leverage ratio was 0.36. Consequently, the board of directors has agreed to propose to the shareholders' meeting the payment of a dividend of 0.05 euros/share for fiscal year 2017, amounting 5.55 million euros, representing a 12.5% payout of the profit obtained in 2017. In parallel, Ercros has purchased 3,102,990 treasury shares, amounting 10.03 million euros, representing a 22.5% payout of the 2017 profit. In order to amortize these shares, the board of directors proposes to the shareholders' meeting the approval of a capital reduction of 930,897 euros, equivalent to the nominal value (0.30 euros/share) of the shares held in treasury stock. If this proposal is approved, the share capital of Ercros will be reduced by 2,796% and will be composed of 107,876,621 shares, amounting 32,362,986.30 euros. Finally, the meeting includes the usual points in this type of meetings. The meeting is called to be held in Barcelona, on June 14, in first call, and, if the necessary quorum is not met, on June 15, in second call.